I am waiting in a field of melted honey, hiding behind a blue tree, that is not really a tree, a root Vincent chose to paint as a tree, you know the painting where roots are the size of trees, gnarled trees with severed limbs, sterile against the golden field swaying, the tall grass bending, and of course no one can tell, but l feel the wind too, swelling my blue-flowered dress, you wont see none of it for I am behind the huge roots that look like trees, you can only feel the wind in the brush strokes. You will mistake my dress bulging on the side for a knot as if I were a distortion of the oversized joints, leaning against the bark as if against one of his fingers, my space so restricted I can barely move. The master knows I am waiting for him, eyes filled with the beauty pouring from his vision. I know he will take these roots and me with them, trees growing into rising clouds at nightfall, and he will show me the city lights everything around us becoming waves of light. When he remembers me, the tip of his brush releasing me, I will tell him how hot it was behind the root that was like a tree, how the bright golden rays made me dizzy. He will take me into his brush, cool me down with linseed oil and in another field show me the evening sky, I come to life again, but no one knows I’m here, the gold of my hair, the blue of my dress broken into lines, narrow paths of color spiraling among the stars on a warm blue night, the moon and the sun becoming one and I and him, the field and the sky circling endlessly. I feel the ripples of the wind, the ocean’s foam, my dress flows domelike, its flowers brighter and brighter, I am everywhere, hear our voices and you now understand what lies in each swirl, your life, mine, his, together in the dance of the stars. 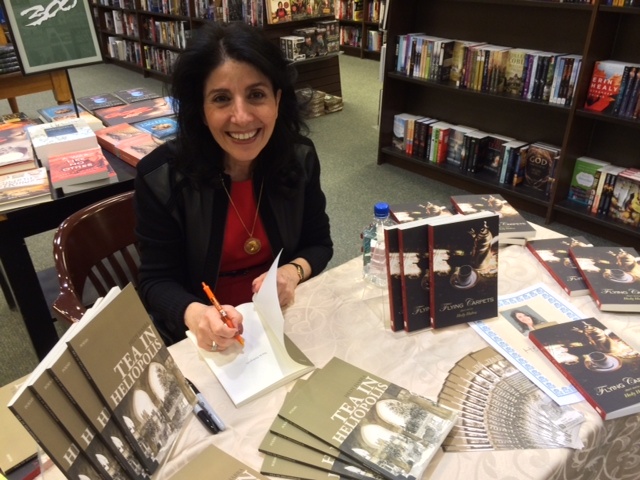 SOURCE: “Waiting in a Field of Melted Honey” appears in Hedy Habra‘s collection Tea in Heliopolis (Press 53, 2013), first published by Puerto del Sol. IMAGE: “Tree Roots” by Vincent van Gogh (1890). ABOUT THE AUTHOR: Hedy Habra is the author of a poetry collection, Tea in Heliopolis, Winner of the 2014 USA Best Book Awards and Finalist for the 2014 International Book Award; a story collection, Flying Carpets, Winner of the 2013 Arab American National Book Award’s Honorable Mention and Finalist for the USA Best Book Awards and the 2014 Eric Hoffer Book Award. Her multilingual work has appeared in more than forty journals and fifteen anthologies, including Connotation Press, Poetic Diversity, Blue Fifth Review, Nimrod, New York Quarterly, Drunken Boat, Diode, The Bitter Oleander, Cider Press Review and Poet Lore. Please visit hedyhabra.com. A lovely and stunning poem!! This is an amazing and very beautiful poem.